Polycarbonate is an advanced material in the family of Plastics. They are a group of thermoplastic polymers containing carbonate groups in their chemical structures. Polycarbonates used in engineering are strong, tough materials, and some grades are optically transparent. They are easily worked, molded, and thermoformed. 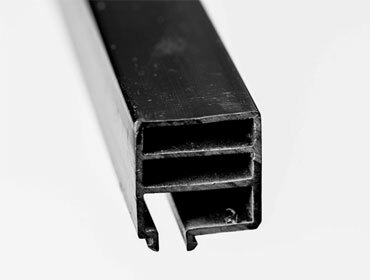 Polycarbonate is an excellent material for plastic profile extrusions because Polycarbonate profiles have great stiffness, toughness, impact resistance and are optically ‘Clear’. Polycarbonate profiles have excellent colorability with a beautiful gloss finish that can mimic glass and metal. Polycarbonate profiles have very good electrical insulation characteristics, do not burn readily, and some people claim that Polycarbonate can be considered "self extinguishing." Additionally, Polycarbonate profiles have great dimensional stability and service temperatures close to 150° C.
Polycarbonate profiles (uV resistant Grade) are an excellent choice for outdoor usage. 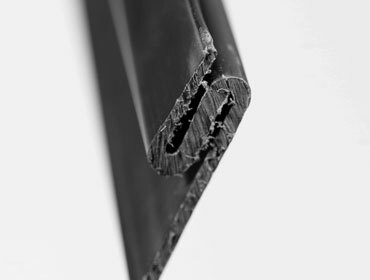 Polycarbonate profiles have fair to good resistance to solvents, but may have a tendency to stress crack upon exposure to certain chemicals. 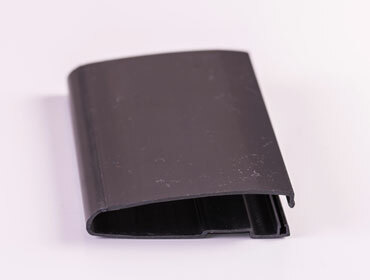 Polycarbonate profiles have good stain resistance to coffee, tea, fruit juices, inks, soaps, detergents, and cosmetics. Polycarbonates were initially developed in the late 19th century. However, they were not effectively commercialized until the 1950’s. Since then, polycarbonates have been heavily employed in many industries, including Automotive, Aerospace, Construction, and Electrical Components. Temperature resistance up to 150 degrees C.
Excellent optical properties, owing to its high Transparency. Polycarbonate profiles have excellent electrical properties and light transmittance values—typically ranging from 86-90%. In addition, flame retardant grades are available, along with special grades that are ‘clear’ AND ‘flame retardant’ which makes it a main choice for usage in the transportation industry. Polycarbonate being an extremely strong polymer with high impact resistance, high temperature resistance and excellent optical properties, owing to its high transparency. Due to these properties and the polymer’s shatterproof nature, it is used as a substitute for glass in many instances. Excellent light transmission is a feature of extruded polycarbonate, which lends itself perfectly to lighting applications and, for years – ‘clear’, ‘ribbed’ and ‘frosted’ Polycarbonate Extrusions have been produced for use with fluorescent lighting. Now, with the growth in the use of LEDs, we offer an ever-expanding portfolio of frost and opal finishes for uses where there is a need to diffuse light or reduce spotting and concurrently maximize light output. Polycarbonates are extremely versatile. Typical uses for polycarbonate profiles include football helmets, exit lights, bulletproof glass, skylights, and firefighting equipment. It is truly one of the toughest plastic materials available today.